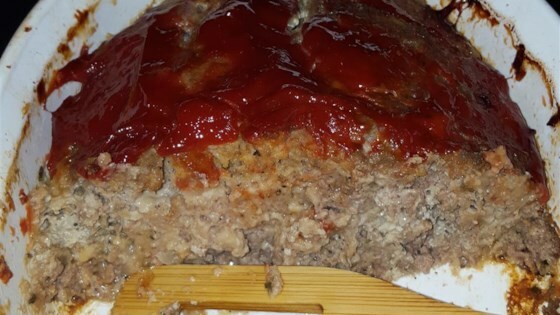 "My husband is a big fan of this meatloaf. Anything you can put beer in is a winner for us!" Preheat oven to 350 degrees F (175 degrees C). Coat a baking sheet with cooking spray. Combine ground beef, ground pork, ground veal, eggs, bread crumbs, pale ale, onion, 3 tablespoons ketchup, mustard, basil, garlic powder, salt, and pepper in a large bowl; mix well. Transfer mixture to prepared baking sheet; shape into 10x5x2-inch loaf. Spread 1/3 cup ketchup on top of the loaf. Bake in the preheated oven until no longer pink in the center, 60 to 65 minutes. An instant-read thermometer inserted into the center should read at least 160 degrees F (70 degrees C). Cool meatloaf 10 minutes before slicing. Excellent flavors, very moist and easy to make. Needed to cook it longer for proper temperature. Not the best but still eatable. Not a fan of this at all. Hubby found it ok so he had leftovers for lunches. I love how moist this meatloaf is. Great flavor!